HGTV for guaranteeing your next soiree will be a smash. 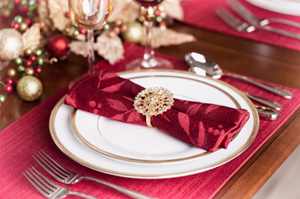 Set the table: Make sure your guests’ taste buds are dying of anticipation by creating an elegant dining setting. use your finest serving pieces, bold tablecloths and simple centerpieces to create a dramatic table space. Simply creative centerpieces: Have your square dinner plates serve double duty by using them as a base for eclectic flower holders and unique accessories. Claim your place: Planned the perfect seating chart? Mark each guest’s place by using colorful place cards. For example, bright frames with guest’s initials in the center are a unique way to stake their claim. Bejeweled napkin rings: Details make or break an elegant setting. If you’re looking to add bling to your ring, try securing vintage jewelry to plain old napkin rings for an instantly glamorous look. With these decorating tips and a few delicious recipes, your friends are sure to have a ball at your next dinner party. luxury home, be sure to explore our site.